Confused and stressed about flying with a dog overseas? I get it. I’ve done it twice this year. But pets are family, and I’d do anything for our new pomsky puppy, Luna Celeste. Our pup has flown internationally twice now. And if you’ve ever flown with your dog, you’ll know how confusing and vague some of the information is online. So, below is a clear guide of what you should know when flying with a dog. 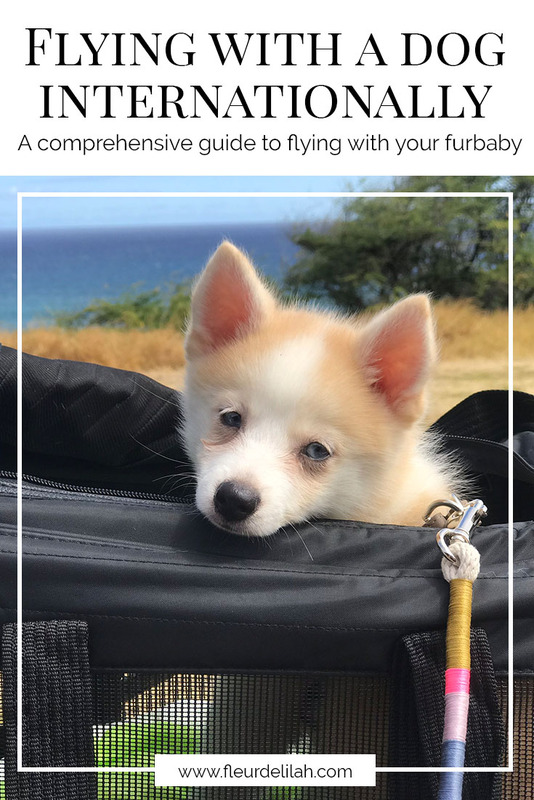 When flying with a dog internationally, your furbaby can fly three different ways: in-cabin, as check-in luggage, or as cargo. All three modes of transport are distinctly different. And which one(s) your pup will travel by depends on a variety of factors including pet size, airline policies, and laws in the country of export/import. So what’s the difference between in-cabin, check-in, and cargo? In-cabin transport is, as the name implies, having your dog in the cabin with you. For many pet owners, myself included, prefer flying with our pet — after all, flying can be very taxing on them. Add to that the numerous horror stories of pets dying in cargo. So why don’t we see more pets on our flights? As you can probably guess, numerous rules and policies restrict in-cabin pet transport. Many airlines outright ban pets in the cabin, save for trained service dogs (not to be confused with emotional support animals, or ESAs, which are not always recognized on international flights). And when flying internationally, the number of airlines that accept pets onboard are even less. Airlines that do allow pets on board often have rules regarding size and breed. Dogs need to be small, usually less than five to 10 kilograms including the carrier. Specific weight restrictions differ depending on the airline. And certain dogs like snub-nosed (brachycephalic) breeds may be restricted to certain destinations or times of the year, or banned altogether. You book in-cabin shipping by calling the airline’s customer service center and telling them you’d like to bring your pup on board. In-cabin shipping is usually the cheapest transportation option. Luna flew in-cabin with me to Japan. And although it was her first flight, she did great. She didn’t make a peep and slept through the whole thing. Flying your dog as check-in luggage is similar to how you fly with any other check-in suitcases: on the day of your flight, you get to the airport early with your dog in their airline-approved hard-sided crate and check them in at the counter. Your dog will then travel in the cargo hold, which is temperature-controlled. Check-in shipping is often confused with cargo (see below). But shipping your dog as check-in luggage means they fly on the same flight and in the same plane as you. This is reassuring since you can pick your pup up at baggage claim. You book check-in by calling the airline’s customer service center and notifying them that you would like to take a pet as cargo on your flight. This option will cost similarly to having an extra suitcase, and the price will depend on the size and weight of your dog’s crate. Certain breeds may required special crates depending on airline policy. Cargo pet transport, sometimes called manifest cargo, is sending your pet as a cargo shipment. Unlike check-in shipping, cargo shipping allows you to send your pet on a different flight as you. 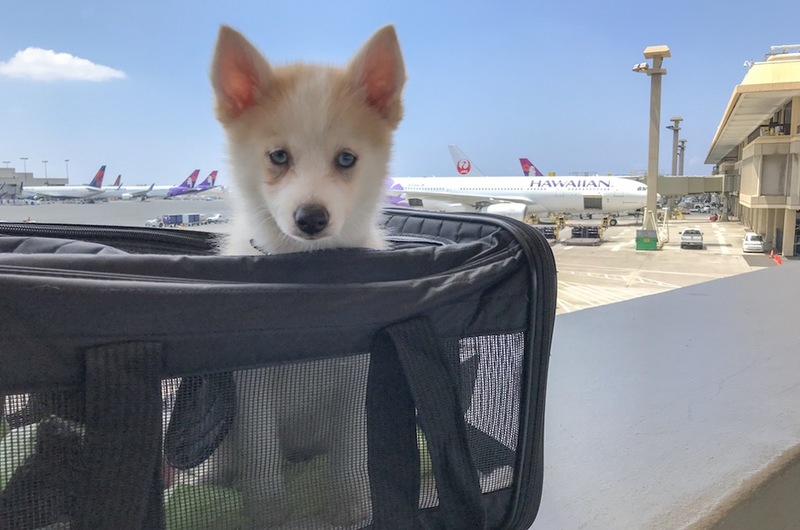 On the day of your pup’s flight as cargo, you bring them to the cargo terminal of an airport in their airline-approved hard-sided crate and follow the process for inspection and exportation. Flying your pet as manifest cargo comes with some challenges. First, you’ll be limited to flights that can accommodate pets as cargo. This often translates to less desirable flight times. Also, if doing it yourself rather than hiring a transportation service, going to the cargo terminal and completing the day-of procedures can be long and stressful. You book cargo shipping through the cargo department. This option is the most expensive, but many pet transportation companies recommend it as the least-stressful option for your pup. Sometimes, manifest cargo is the best, if not the only, way for your pup to fly. For our family, I try to avoid this option. We had to ship Luna as manifest cargo once due to import laws, and she was so stressed from the experience that she got sick. If you’re moving internationally and taking your dog with you, start researching early. Different countries have different requirements. Many have a specified timeline for required vaccinations and blood work. In some cases, you need to start preparations a year in advance. Specific requirements vary from country to country. Check the import details of the place you’re moving to by visiting the government’s official agricultural site. Rabies-free: These regions have not had a case of rabies for years. Only a few countries are considered rabies-free, and most are island nations. Exporting pets from rabies-free regions usually requires less paperwork and time. Rabies-controlled: These countries have a low incidence of rabies. Many countries in the EU and North America usually fall into this category. High-rabies: These countries have a high incidence of rabies. Many of these countries are in developing nations in the Middle East and Africa. Pets from high-rabies countries will usually be subject to a quarantine period. Exporting pets to a country with a lower rabies control status requires less paperwork. On the other hand, importing pets into a country with a higher control of rabies requires extensive amounts of paperwork, blood work, and time. Your pup may even have to stay in quarantine for a few months. With so much to do, is it best to do the paperwork yourself or ask for professional help? If you have a lot on your plate with the move or just don’t have the experience, you may want to hire a pet transportation company. These people know what to do and how to do it as efficiently as possible. Many pet transportation companies offer door-to-door service, so you don’t have to worry about a thing. Using a pet transportation company is a great option if you’re worried you’ll forget some of the paperwork or make a mistake. The biggest downside to using a pet transportation service is price. Due to some cargo laws, we had to use one of these services when we flew our girl to Hong Kong. It ended up costing nearly four times the price it would have had I been allowed to do it myself. I was extremely frustrated by this because I knew I could do it myself and had already done a lot of the paperwork. A cheaper alternative is to do everything yourself (as long as you aren’t blocked by some law like I was). This option requires a lot of research and time, as well as a good understanding of everything that’s needed. But, you can save a lot of money, and it’s a good choice for helicopter pawrents (like me). I went with this option when flying Luna to Japan. Doing everything myself took a lot of time, and I had to ask the agriculture department a lot of questions. Some days I was so stressed — things just weren’t working out smoothly. But in the end, everything did. And now I’m comfortable and prefer doing things on my own. So, should you DIY or hire a pet transportation company? Both options have their perks. And both have their drawbacks. Review your situation and go over your priorities before deciding what’s best for your family. Crates — some people love ’em, and some people hate ’em. But whether or not you regularly crate your dog is irrelevant. On a plane, your fur-family will be in a crate for a long time. A flight that might take only seven or eight hours door-to-door for dogs flying in-cabin can take up to double that when flying as cargo. If your dog isn’t comfortable in their crate they can get anxiety, try to escape, and hurt themselves. So make sure your pup’s crate training is solid. If your dog doesn’t know how to be alone, they will have a problem in cargo. You need to teach your pup that being alone is good. Like dogs who aren’t crate-trained, a dog that doesn’t know how to be alone can get anxiety, try to escape, and hurt themselves. Dogs in cargo will have little-to-no interaction and nothing to entertain them. Train your dog to be alone so they are unfazed by the long flight. When’s the last time you had to hold your bladder for 10, 15, 20 hours? So how can you expect your dog to? If your large breed pup sleeps through the whole flight and is able to hold it, that’s great! But being alone in an unfamiliar place with loud noises from the engine can keep them up and they might have to go. Meanwhile, smaller breeds have tiny bladders that need to empty more often. You can let your pup hold it until they’ve reached their breaking point and have to go, but then they’ll think they made a mistake. Because your dog doesn’t know using the pee pad is OK, they won’t differentiate between using the pee pad in the plane and peeing on the carpet at home. Instead, set your pooch up for success and train them to use pee pads. Pet owners already have difficulties flying with their dogs. So, don’t make it worse — train your pooch how to behave around others. This means your dog should know how to be calm, quiet, and just well-behaved in general. It’s fine if your dog makes a little whine once or twice during the flight, but a vocal dog in-cabin will annoy other passengers. Ideally, your pup is so well-behaved that no one even notices them. Leash: a slip-lead is often recommended since it makes going through security simpler. If you don’t have one, your normal leash and collar will work fine. Toys: bring one or two of your pup’s favorite toys. Choose toys they can play with on their own like a chew toy. Avoid squeaky toys so you don’t get complaints from other flyers. Pee pads: your dog will be in its crate/carrier for a long time. Pack pee pads (reusable ones are available for eco friendly pawrents!) to make cleanup quick and easy. Snacks: if it’s a long flight, you might want to pack some dry snacks or dog food. They can also be used to keep your pup quiet if they get a bit noisy. Travel bowl: a travel bowl makes it easier to give your pooch food and water during the flight. To prevent your dog from drinking too quickly, offer them some ice cubes. This’ll help them from having to pee too much. Pee pads: Pee pads are required for pets flying in cargo. So, teach your dog to use them. Dog food: for long flights, you are required to send a serving size of your pup’s food with them along with the last time they were fed. Food and water bowls: Food and water bowls must be attached to the crate door. You can freeze the water the night before so it doesn’t spill. Smelly personal item: If your pup gets sad when you’re away, throw a worn piece of clothing into the crate with them. Your dog may chew it if they’re anxious, so don’t use your brand new shirt. While some websites encourage you to pack a toy or two with the dog flying in the cargo hold, some policies do not allow them. When Luna flew cargo I tried to pack a toy with her, but it wasn’t allowed. Give your dog plenty of mental and physical exercise before the flight. I had Luna so tired before the flight to Japan that she slept through the whole thing. Feed your dog a few hours before the flight so they have time to go to the bathroom. This will also help prevent them getting sick on the plane. Talk to your vet before giving sedatives or tranquilizers to your pet. These can create respiratory and cardiovascular problems as altitude pressures change in flight. Double check you’ve packed your dog’s things. Don’t forget any of the paperwork for import or export. Arrive at the airport on time. If your dog is flying in-cabin or as check-in, this usually means an hour or two earlier than normal. For dogs flying as manifest cargo, check with animal quarantine at the airport of departure. Let your dog stretch its legs and go to the bathroom once more before the flight. For dogs flying in-cabin, check for pet relief stations in the airport prior to the day of the flight. After the flight, your pet will probably want to get out of its crate and go to the bathroom. Take your pup through import and quarantine and then find somewhere you can let them out. Want more expat life and travel tips? Sign up for the newsletter!